Washington junior Drew Moats drives with the ball out from under the basket during a non-conference game at Vinton County High School Saturday, Feb. 2, 2019. Also pictured for Washington (l-r); Miguel O’Flaherty (5) and Eli Lynch (1) (both juniors). McARTHUR — The Washington Blue Lions made the trip over into Vinton County (just outside of McArthur) to take on the Vikings in a non-conference game Saturday night. In their previous game, the Blue Lions had given up eight three-point field goals in a 51-42 loss to Logan Elm. 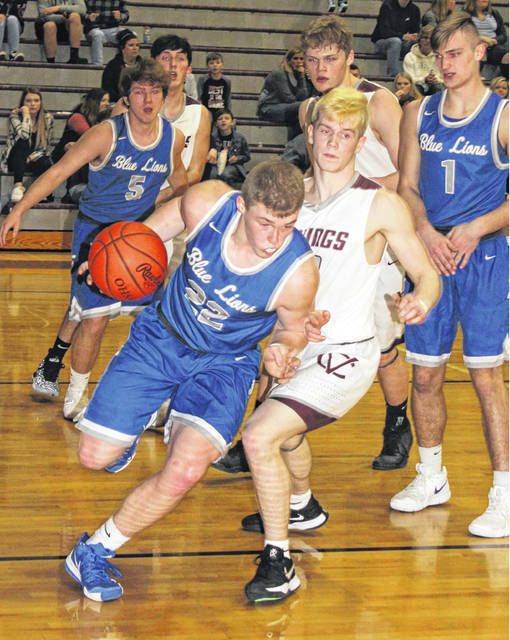 Saturday night, the Blue Lions allowed three three-point field goals and came away with a 44-42 win over Vinton County. The game came down to the final moments, as close games generally do. The Blue Lions had just taken a 44-42 lead on a fine spin move and basket by the game’s leading scorer, senior Omar Porter. That score came with just over one minute to go in the game. Many in attendance were now on their feet to watch the action unfold. Vinton County missed its next shot attempt that would have tied the game. After a Blue Lion time out to avoid a turnover when it appeared they weren’t going to inbound the ball in time, Washington missed their field goal try, a lay-up that would have given them a four-point lead. The Vikings had the ball and called for time with 35.8 seconds remaining. Vinton County missed a shot, but got the offensive rebound and called for a time out with 14.1 seconds remaining. Coming out of that time out, Vinton County worked the ball around and finally, with the crowd screaming and time running out, the Vikings took a two-point shot that went in, very close to the buzzer. It appeared that the game was heading to overtime. However, the officials conferred briefly and declared the ball left the shooter’s hands after the buzzer (truly a split-second situation) and that gave the Blue Lions the victory. The Vikings’ faithful were upset with the call just as much as the Blue Lions were elated. A few plastic bottles were thrown onto the court as the officials hurried off. It was certainly a tough way to lose a game for Vinton County, and, conversely, an exciting victory for Washington. Porter led the Blue Lions with 16 points. Evan Upthegrove scored nine, Garitt Leisure had seven and Miguel O’Flaherty and Blaise Tayese each had six points. Washington won despite making just 5 of 15 free throw attempts for 33 percent. For the Vikings, Gavin Arbaugh, Trafford Dunn and Eli Griffith each scored 10 points and Ricky Body scored nine. “I thought we guarded the ball, the dribble, really, really well,” Washington head coach Connor Scott said. “Evan defensively today was one of the best I’ve ever seen. Number five for Vinton County (Arbaugh) is a top tier player. I thought Evan made his life tough on every possession. The Blue Lions had to weather some foul difficulties in the game. “Our first four fouls were two on Richie and two on Blaise,” Scott said. “So there go our two tallest guys and our two post defenders and they have a very good post player. Washington (now 11-6 overall) is at Unioto Tuesday with the j-v game starting at 6 p.m.
WASHINGTON — Eli Lynch 0-0-0; Evan Upthegrove 4-1-9; Miguel O’Flaherty 2-2-6; Blaise Tayese 2-2-6; Garitt Leisure 2 (1)-0-7; Omar Porter 8-0-16; Drew Moats 0-0-0; Richie Burns 0-0-0. TOTALS — 18 (1)-5-44. Free throw shooting: 5 of 15 for 33 percent. Three-point field goal: Leisure. Field goal shooting: 18 of 53 for 34 percent. Turnovers: 4. VINTON COUNTY — Will Arthur 0-1-1; Ricky Body 0 (2)-3-9; Austin Hitte 0-0-0; Gavin Arbaugh 3 (1)-1-10; Lance Montgomery 0-2-2; Brock Kaman 0-0-0; Ash Abele 0-0-0; Tratford Dunn 4-2-10; Eli Griffith 5-0-10. TOTALS — 12 (3)-9-42. Free throw shooting: 9 of 14 for 64 percent. Field goal shooting: 15 of 40 for 38 percent. Turnovers: 13.